Lori Berenson's sentence could be commuted and she could be sent out of Peru, an official says. 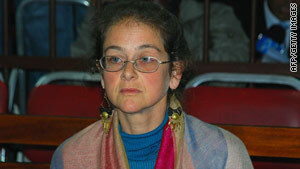 Lima, Peru (CNN) -- Lori Berenson, a U.S. citizen imprisoned in Peru since 1995 for helping leftist rebels, was released on parole Thursday afternoon. Government-run TV Peru showed Berenson walking out of Chorrillos Penitentiary in Lima, Peru's capital, and getting into a waiting car. She did not respond to shouts from a throng of photographers and reporters. She got into a late-model black Hyundai driven by her lawyer, who is also her estranged husband, and they drove together toward the apartment she has rented in the upper-middle-class neighborhood of Miraflores, two blocks from the water. At one point in their trip, they were involved in a minor traffic accident with a car driven by a journalist. They arrived at the five-story building and walked up the stairs to the penthouse floor. Later, relatives of victims of terrorists protested her presence in the neighborhood. Berenson has said she plans to work as a translator and to study baking. She had served nearly 15 years of a 20-year sentence for aiding Peruvian rebels in a 1995 plot to attack the nation's congress and overthrow the government. Judge Jessica Leon Yarango announced the 40-year-old woman's conditional release in a televised court hearing this week, one day after Berenson's lawyer made the request. Justice Minister Victor Garcia Toma said the president's council of ministers will discuss the option of expelling Berenson at the cabinet's meeting next week, the government-run Andina news agency said. Garcia Toma said he had not discussed the issue with President Alan Garcia but he believes the cabinet will agree due to the uproar the decision to release Berenson has caused, Andina reported. Berenson's lawyer, Anibal Apari Sanchez, is running for political office and lives in a poorer neighborhood. Berenson gave birth in May 2009 to their son, Salvador. Under the terms of her parole, Berenson was forbidden to leave Peru and had to live in Lima, the nation's capital and the city in which she had been incarcerated, her parents said on their Web site. Journalist Maria Belaunde contributed to this report.